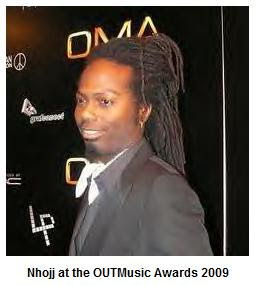 "Indie recording artist Nhojj made OUTMusic Awards history when his ballad Love (watch video below) was voted 2009 Outstanding R&B/Soul Song of the Year by The Alliance of LGBT Recording Artists & Performers. This marks the first time an African American male has won an OMA," reports Billboard. Nhojj is also the first artist to win the OUTStanding R&B/Soul song of the year. OUTMusic added this and other categories to the ceremony this year to more fully reflect the music of the LGBT community. After his win, the singer/songwriter took the stage performing Love before an audience including OMA Lifetime Achievement recipient Kevin Aviance, Village Voice columnist Michael Musto, LOGO personalities DeMarco Majors and Julie Goldman among many other notables in the LGBT community. The ceremony was hosted by Noah’s Arc star Rodney Chester and GLAAD Media Award winner Kate Clinton. The Logo sponsored event was held December 8, 2009, at the legendary Webster Hall in New York City. It is the biggest night in LGBT entertainment, and the only gala ceremony of its kind in the world. Nhojj grew up in Guyana and Trinidad, where he performed for the Presidents of both countries. He began singing in church at the age of 5, but didn't embark on a career in music until after graduating from NYU with a BA in Economics. Earlier this year he returned to his Caribbean roots and performed "Love" at the 2009 Barbados Music Awards. To date Nhojj has released six CDs and an unplugged live DVD by Emmy nominated director Bill Cote. He has performed at Lincoln Center, and toured the United States, Canada, the Caribbean, and the United Kingdom. In addition to his recording and performance schedule, Nhojj regularly donates his gift of music to people living with HIV/AIDS. He performs in hospitals, hospices, residential facilities and treatment centers throughout New York City , as part of the Lifebeat “Hearts and Voices” program.